The ratio in the infant program is one teacher for every three children, with a maximum of 10 children and three teachers, throughout the duration of the day. Our Infant Program accepts children from the early age of six weeks through to 18 months, and has been specially designed to create a warm and secure environment for infants as an extension of their home. 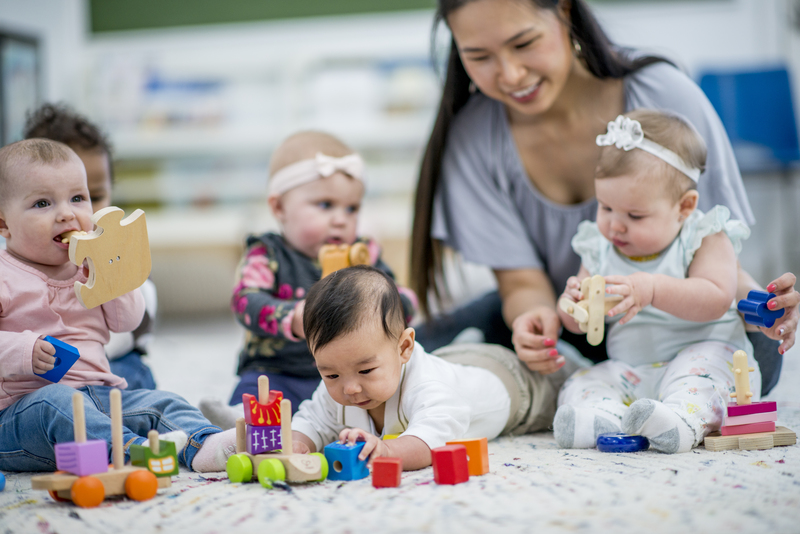 Our teachers work collaboratively with parents to ensure consistency with the infant’s daily schedule; including nap times, play times and feeding times between home and our centre. The Center’s loving and nurturing atmosphere helps infants develop a sense of trust, autonomy, encourages curiosity and motivates learning. A variety of toys, games, stuffed animals, pull and push equipment and music is available as infants grasp new ideas, discover language, crawl and walk, all while growing into little independent people. Transitions are available to ease children and parents into child care. Although a suggested transition schedule is followed by most, transition periods may vary depending on your child and their disposition. Our supervisors and teachers will work together with you and your family to ensure a smooth transition that you are comfortable with.